If you’re thinking of living on the road anytime soon here’s 10 van life essentials that you’re going to need before you set off on a that epic adventure. These products vary depending on the size of your camper, the duration of your trip and the budget that you have in mind. Some of this gear has been tested by the Van Clan team so you can assure we only recommend the highest quality products here onsite. We also assume that you have the very basics in your campervan such as a fridge, a bed and some kind of cooking area, if you’d like advice about these specific items be sure to shoot us a tweet @vanclans and we’ll help you out. Let’s take a peak at some of our recommendations for your next road trip. Here’s our Top 10 List of the best van life essentials you need. Most campervans as we know it, do not have the privilege of owning its own shower room, so the genius team at Heelio have created a portable outdoor shower that uses a pressure pad at your feet to re-create that ‘overhead’ shower feeling that we all know and love. The durable bag is made from a deep black, tear-free plastic material that has purposely been created to attract heat, allowing you to fill up the 11 litre shower, and hang it in direct sunlight to heat up the water inside, after 15 minutes, you’ll have a piping hot shower that can last up to 5 – 7 minutes of standard flow. Using it is very simple, place the shower bag on the floor, place the pressure pad under your foot, give it a few pumps and you’ll have a steady flow of water coming from the hand pipe which you can clean you, your gear and even your camper with. 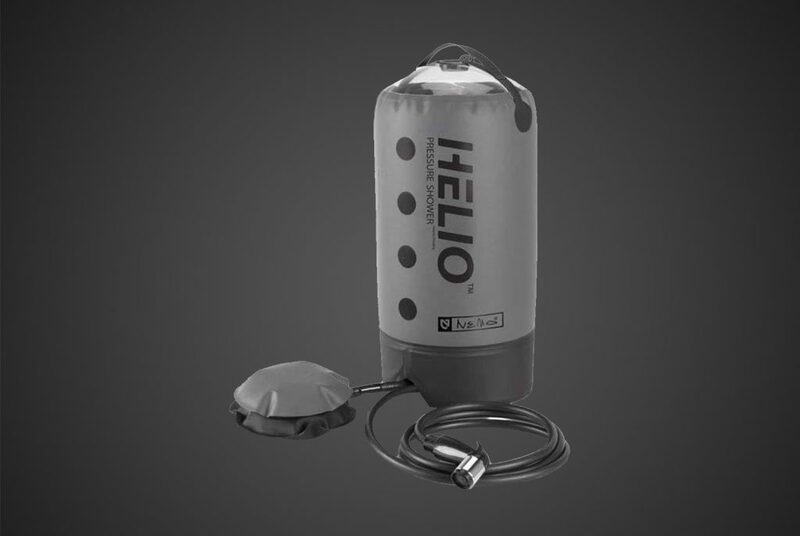 The Heelio Portable Shower costs around $99.99/£72.99 on Amazon. 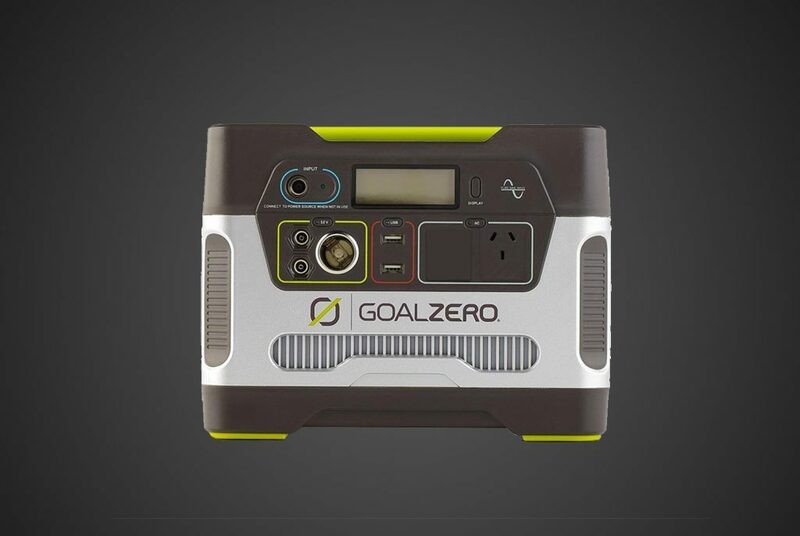 Most of us can no longer live on the road for a short period of time without needing power, so this product is perfect for you digital nomads, instagram influencers and YouTubers out there that need a reliable source of power. 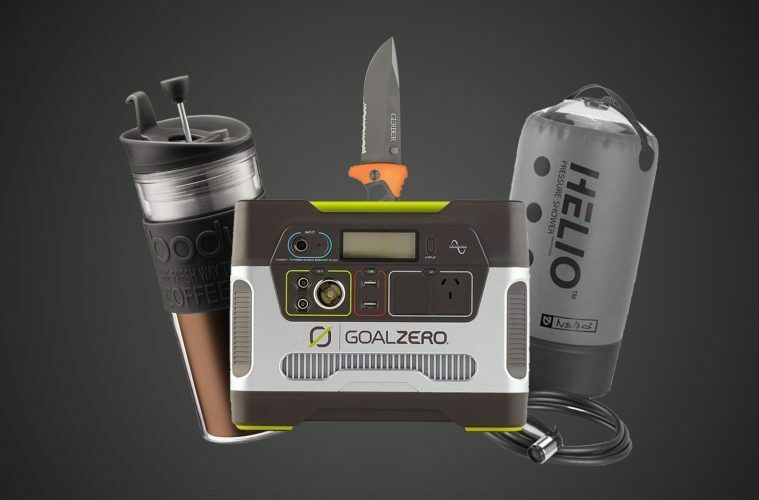 This is the Goal Zero Power Station 400, it uses a 12V, 33Ah sealed lead-acid battery (AGM), this is similar to what is found in your typical car. On the front comes a number of different outlets for all of your electricity needs, and a small LCD screen that showers battery life, how much power is going in, and how much power is going out. It’s been built for rugged use, so it has strong rubber padding on the bottom and an overall durable shell to keep this living in your van for many years. On top is also a nifty handle for you to quickly grab and go when you need it in or out of your camper. To get juice into this thing you can use Goal Zero’s solar panel accessories, or you can plug it into your campers 12v adapter up front and charge it while driving which should fully charge this beast in just under 11 hours which I know some of us has done in a day! It can also charge a normal laptop to full over 7 times, so this takes a high seat in this van life essentials list. Perfect for you work’aholics. This can be found on Amazon for $449.99/£349.99. Your best friend is the sun! The sun will practically give you free energy and with that energy you can power a lot of things, one being that Goal Zero Yeti 400 we just spoke about. 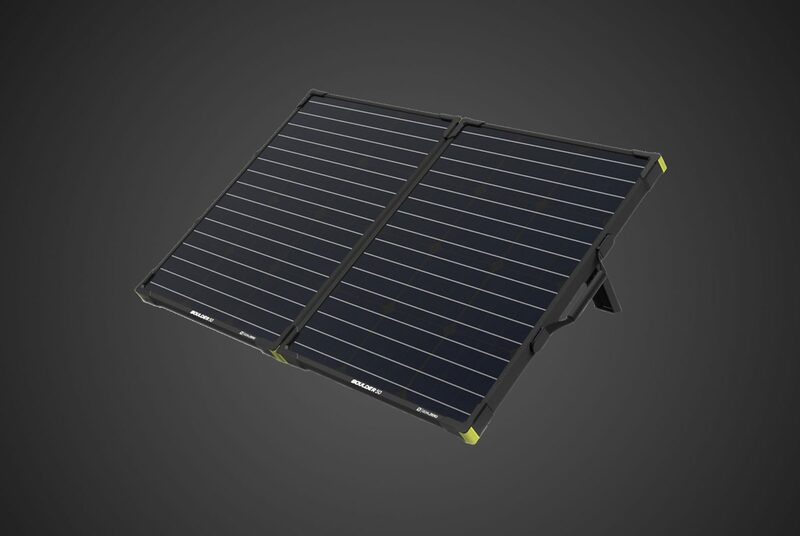 This giant 100-watt monocrystaline solar panel is a perfect fit for the roof of your adventure van, simply pop it on top, connect it to your Yeti with the included cable and wallah, this beauty will start charging your Yeti during the day passively! Around the edges you have a durable anodised aluminium frame with tempered glass covering the panels themselves allowing for it it to take hits, scratches and minor bumps. Admittedly there are cheaper solar panels around but this off-grid panel is super easy to set up and ties in simply with your yeti, so if you want simple this one is for you. This can be found on Amazon for $249.95/£189.99. The Ridgemonkey Sandwich Toaster has been a life saver when it comes to cooking meals on the go, from darn good toasties to full blown pizzas this cooking utensil can literally cook up a storm. It was first created for fisherman who fancied whipping up a warm meal on their trips, but us van lifers soon took it into our own world to use and it has come a must-have kitchen accessory for many popular van dwellers. It has a very attractive near-black finish alongside a handle that has been moulded to feature a non-slip finish for better ‘flipping of the toastie’. When locked in place via the handle we found liquid does not seep out, so when you’re cooking those greasy, liquidy meals you’ll be fine to flip it with no problems. The main feature we love about this is about the amount of things you can cook in this thing, there are quite literally hundreds of meals ready and with little hassle. This can be found on Amazon for $19.99/£14.99. When you got to go, you just got to go and there’s nothing more uncomfortable than squatting in a bush or using one of those public toilets filled with spiders and needles. No thanks! 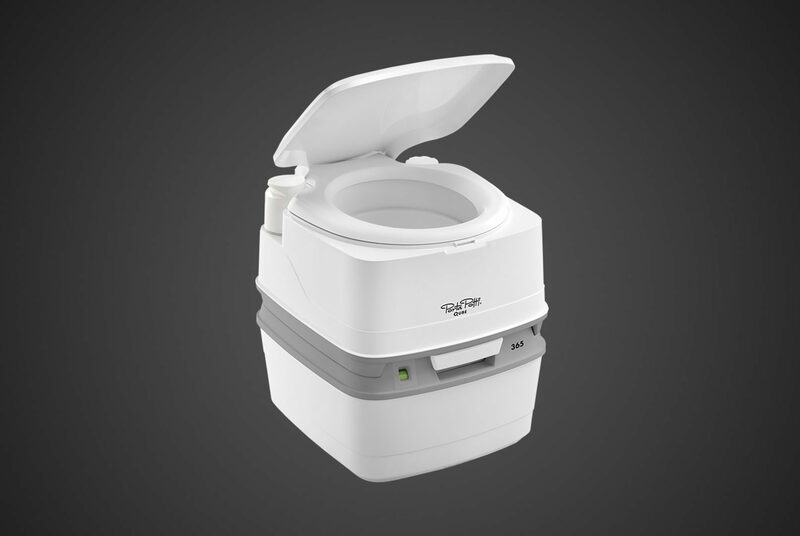 So another one for our van life essentials list is one that you’re most certainly going to need, and that is this compostable camper toilet which can fit neatly away in your camper. Now a lot of van lifers don’t need one and are fine with public toilets but there’s a lot of us out there that want the choice of pooping when we please. This is the Porta Potti Qube 365, it’s one of the larger camper toilets so if you’re looking for a smaller one they also do a downgraded version for “porta”bility. There isn’t much to say about it apart from it has a removable tray below that lets you add your bio-degradable compost, and it’s slim design allowing you to place it those small storage areas for safe use. This can be found on Amazon for $89.99/£69.99. A decent knife will do you wonders on the road and you’ll regret not having one when you set off. 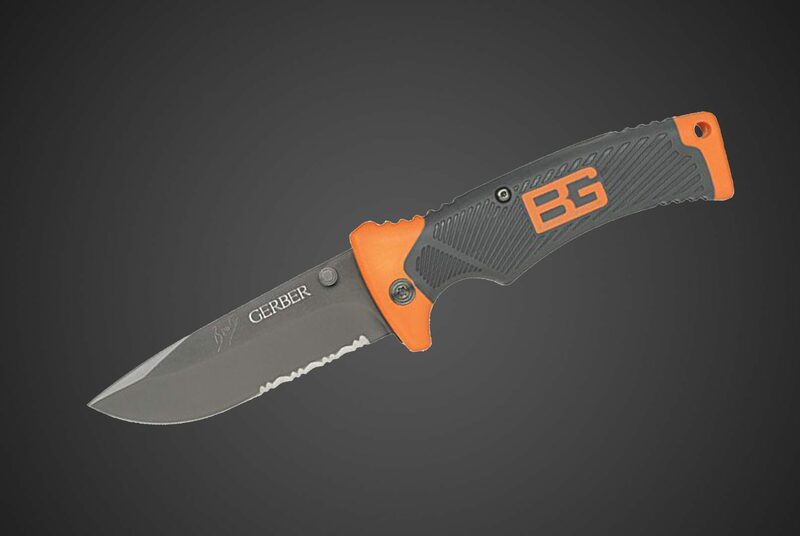 For many years we have used Gerber knives and they do not disappoint, they’re sharp, sturdy and the handle usually has decent grip to it allowing it to be used in all kinds of weather. There’s nothing like a warm coffee overlooking some cracking views, and what better way to have it than in a coffee press and portable mug all in one, so you can even press your coffee when driving! This beauty is created by a company called Bodum and they’ve put a press inside this stunning vacuum packed coffee mug! It holds a single serving of coffee or loose leaf tea and the silicone and mesh filter removes all of that crappy sediment. To use simply add 3 tbsps of ground coffee, your milk and sweetener then add boiling water to the mug. Switch on the plunger lid, after 4 minutes press down and then you’re ready to enjoy a warm brew in a well designed mug. This can be found on Amazon for $29.99/$22.99. You’re going to need some decent beats on the road, music keeps us moving, physically and mentally so having a nice, loud bluetooth speaker in your van life essentials arsenal is a must. Using your built in speakers just wastes your campers battery and nobody likes that, so having a separate portable station keeps that fear away. This is the JBL Charge 3, it connects to your devices via bluetooth and can last up to 20 hours from one full charge. 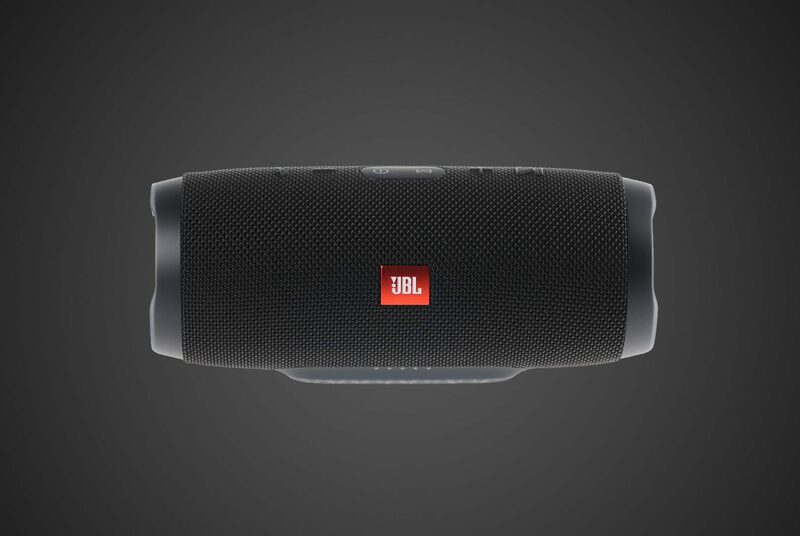 The reason we make this one one of our van life essentials is because JBL creates some of the best speakers around, they’re loud, hi-tech and water resistant, so you can have this beast with you next to the lake or with you on the beach! And don’t worry about dropping it, this as a rubberised exterior shell which decreases impact damage, so it’s sure to last on your rugged adventures! This can be found on Amazon for $139.99/£119.99. You may think this one is a little bit overkill and not necessarily a van life essentials product but without doubt it’s one of the more important ones. Our smartphones are where we connect with the world, and it’s also a piece of technology that can keep us safe in emergencies or when times get rough. 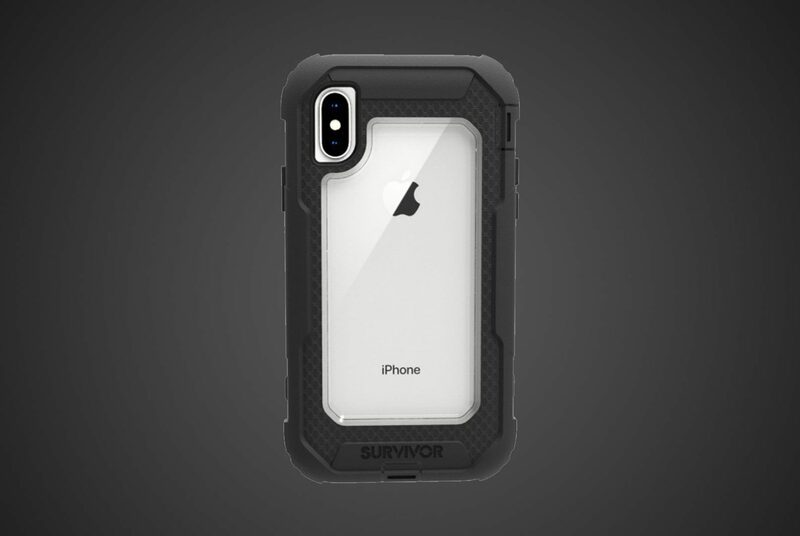 We advise protecting your smartphone in a Griffin Survivor Case, it practically makes your phone indestructible and will no doubt save you money in the long run. Griffin make this case for a wide number of iOS and Android devices so check here on Amazon for availability. We use our smartphone for hours a day, uploading Instagram pictures, contact family members, and keeping in touch with our community, so breaking it, is certainly not on our list for things to do and it’s also not in our budget neither! Protect your phone and you’ll be saving money and keeping safe on the road. This can be found on Amazon for $29.99/£24.99. So there you have it, our 10 best van life essentials you need for your next adventure, let us know if any of you have recommendations for products that we missed out on and we’ll be sure to add to them to the list if we see fit! Or head over to our Instagram and Twitter page if you’re looking for some answered questions! Thanks for stopping by.